Through the workshops we ran in July, we met a number of health-related businesses who were keen to improve their Google Ad campaigns. Like most businesses where the owners are busy working with customers, marketing can really be improved. The problem is that most businesses don’t know what a good campaign looks like. We look at campaigns from the perspective of outcome with the most important factors being the number of conversions and the cost per conversion. If the first one can be increased and the second one decreased, then you are doing good. One other factor, which is the quality of enquiries, sits above all and is often hard to measure. Working this one out can be tricky and requires analysing the entire customer enquiry process from start to end. Usually, the issue is the disconnect between the ad and the sales process which can be easily fixed. At first sight, the number of clicks and the cost per click (CPC) looked good. However, when looking at the outcome of 7 conversions and 0.79% conversion rate, we decided to double check if the stats were accurate. We suspected that the conversion tracking might have been set up incorrectly. Unfortunately for the business, these stats were correct. This worked out as each enquiry costing around $108.56. Quite expensive according to our standards. With our process that we’ve put together specifically for health businesses, we use landing pages that address each of these areas. We find that this improves the overall conversion process immensely. Also, it’s important to understand how the customers contact the business (phone call or form/email enquiry) and fine-tune the layout to present what’s convenient for the customer first. The cost per click went up, but so did the number of conversions. 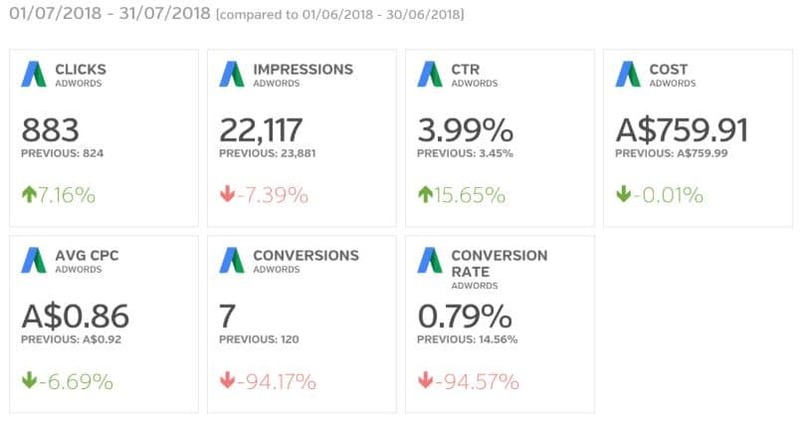 So overall after the first month of running AdWords we’ve been able to triple their number of leads using the same budget. The cost per conversion ended up being $43.21. That’s less than half of the previous conversion cost. 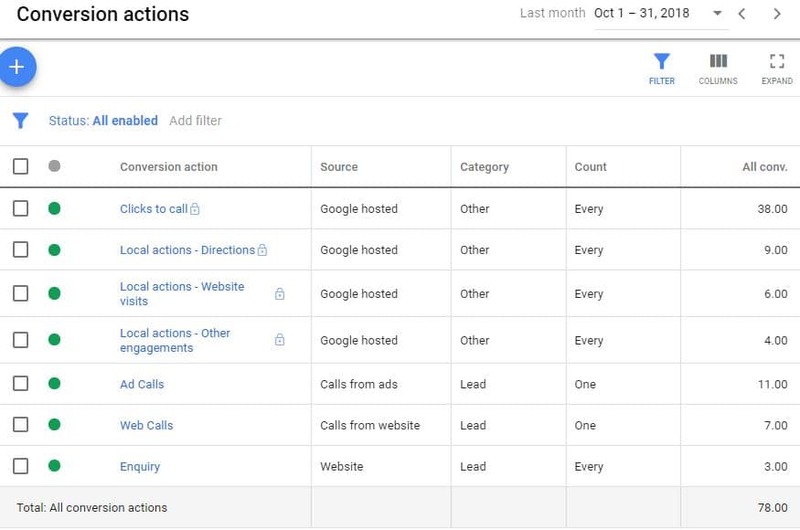 This shows an additional 38 calls from the Google Maps Ad listing. So really, there should be 59 enquiries generated from the Google ads campaign in total. This graph shows the number of website visits, people requesting directions, and phone calls. As you can see, the number of calls for October was the highest with the spike at the end of November. 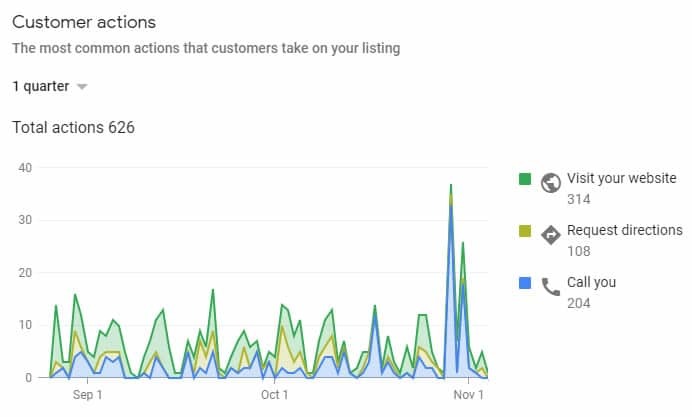 That spike represents 33 calls which are very unusual for most small businesses. Over the last 2 years, we’ve been working with dozens of health businesses ranging from dentists to physios. Every time, we’ve been able to deliver the leads at a substantially lower cost than the business’ previous campaigns. To achieve this, we’ve used our unique approach which entails landing pages, client’s sales process and refined audience targeting. This process is tailored to every business individually, and delivers leads at an affordable rate. Let us know if you have any questions regarding these stats and we would be happy to take you through them. If you are interested in finding out more about our lead generation approach or just wish to improve your Google rankings, don’t hesitate to reach out to us. We offer a free consultation to see if we can help you.